​Fulham will host Brighton at Craven Cottage on Tuesday in what the London side's fans know is a must-win match for their club, as they look to better their chances of getting out of the drop zone. Fulham have been battling to get going the whole season, while new boss Claudio Ranieri hasn't been able to steer the ship in the right direction since his arrival. Brighton look as if they'll be safe this season, seven points clear of the relegation zone – but in the Premier League there are very few certainties. Ryan Babel looks set to start after impressing against Tottenham in his debut for his new club. As for injuries, Fulham are still set to be without key players Alfie Mawson and Frank Zambo Anguissa – while fans have seen the last of Aboubakar Kamara, as he looks to force a move away from the club. The Seagulls look set to be without the injured Jose Izquierdo, but Bernardo could be back in the lineup after missing the game against West Brom in the FA Cup. Alireza Jahanbakhsh is still on international duty with Iran, although Australia's exit from the Asia Cup means that goalkeeper Mat Ryan could make a comeback to the team. ​Fulham ​Rico; Odoi, Le Marchand, Ream; Christie, Cairney, Seri, Bryan; Schurrle, Mirtrovic, Babel. ​Brighton ​Ryan; Montoya, Duffy, Dunk, Bong; March, Groβ ,Stephens, Propper, Locadia; Andone. 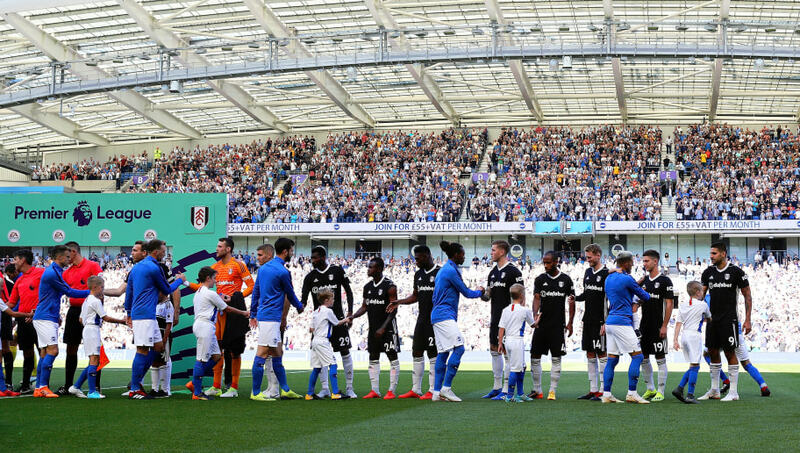 Fulham vs Brighton is a game that has only been played nine times – with Brighton winning five of those games. The Cottagers have won three of those, with the remaining match ending in a draw. This game has an average of 3.22 goals per match – so expect goals and fun. Their most recent encounter ended in a 2-2 stalemate in the beginning of September. Fulham will feel hard done by after their last-gasp defeat to Spurs last week, especially the manner in which it took place. That loss left them without a win in four games, and needing to win this game if they are to have any chance of getting out of the drop zone soon. Playing at home should allow them to have the upper hand but, with only three wins all season, every game is that much more difficult. Brighton have also only won one of their last five fixtures, with two draws and two losses in that time. That being said – those defeats came against Liverpool and a resurgent Manchester United. Fulham are aiming to end a run of four successive Premier League defeats, with Brighton also hoping to respond to two losses on the spin. Fulham haven't managed to get the better of their opponents in their last six encounters. The London side will be hoping new man Ryan Babel can inspire their team to get a victory and gain some momentum in their fight to get out of the relegation places – and the former Liverpool man will be encouraged by the fact that Brighton have not kept a clean sheet in their last 13 Premier League matches.